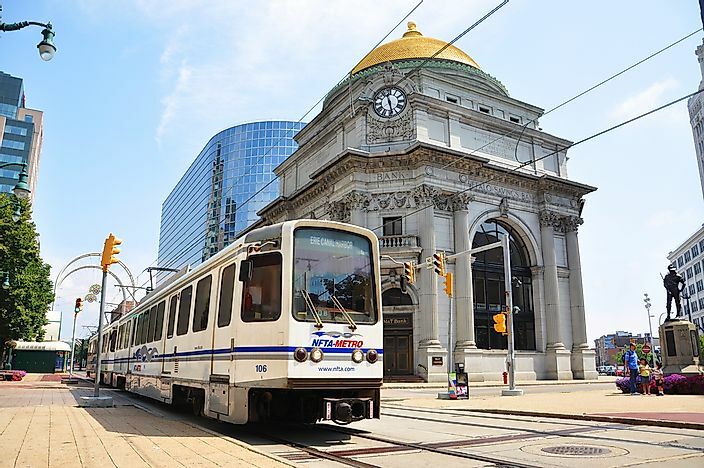 A metro rail train travels past the historic Buffalo Savings Bank in downtown Buffalo, New York. Photo credit: jiawangkun / Shutterstock.com. The rise of modern cities in the US has too often led to the destruction of the old buildings to make way for the new, corrupting the historical heritage of these towns. However, Buffalo is a city which has, for the most part, been spared the wrecking ball. The benefits of architectural tourism in Buffalo are twofold: improving the city’s economy while preserving the historical heart of the city. Buffalo, after all, was founded through architectural experimentation. It flourished to become one of the most well-planned American cities before the Second World War. Today, some buildings in Buffalo have been damaged or abandoned. However, the city also features old buildings and constructions depicting unique architecture from as early as the 19th century. Some of these architectural works are those of famous architects such as Frank Lloyd Wright, H.H. Richardson, and Louis Sullivan. These architects broke the existing European architectural traditions expressing new and more fluid designs reflecting the American society. Editorial credit: Felix Lipov / Shutterstock.com. The Prudential Building is a historic skyscraper in Buffalo designed by Louis Sullivan and Dankmar Adler. The architecture of the city draws from many unique schools including Art Deco, Brutalism, Chateauesque, Gothic Revival, Art Nouveau, Victorian, Sullivanesque, Greek revival, and Federal Style. Buffalo has some of the oldest and most intact architectural constructions in the US, often achieved through the careful and elaborate planning of the post-American civil war masters such as Frederick Law Olmsted and Joseph Ellicott. Some of the buildings have survived through times with the damaged ones renovated, and others maintained, upgraded and repurposed to revive the city into an entirely new architectural cityscape. Unique architectural landmarks of Buffalo include the Albert-Knox Art Gallery, the Buffalo Centre Terminal, Buffalo City Museum, Delaware Park System, the Old Post Office, McKinley Monument, Birge-Horton house, Darwin D. Martin House, and the Larkin Administration building. These landmarks are famous tourist attractions pulling thousands of people from places around the world. The interior of the Buffalo and Erie County Botanical Gardens greenhouse. The gardens were designed by famous landscape architecture Frederick Law Olmstead. In a bid to improve the city's economy, various restoration projects have been underway. This reflects the desire to restore the city to reflect the past it carries while at the same time moving forward into the future. Unlike the trend of demolition and rebuilding, which was popular in the United States from the 1960s through the 1990s, today's restoration projects maintain the old allure and add a modern touch to the historical landmarks. Private individuals and organizations, as well as the federal government, have taken the initiative to make the city an architectural tourism destination. According to USA Today, the most recently completed project is the Hotel Henry project raised from the ruins of the Buffalo State Asylum and named in honor of Henry Richardson, the architect who designed the Asylum. The hotel occupies a third of the asylum and consists of various modern features such as 88 guest rooms, a modern conference center with technology fittings and an urban resort. Tourists visiting the city may enjoy various architectural and historical landmarks of the city through guided tours.